Linux is, if you don't already know, an open-source Unix operating system. I have been using it now for over 30 months (I started in the summer of 1997), and never boot to win95. In fact, the last time that I can remember booting to windows was over eighteenteen months ago. I average an uptime of about 50 days, and it is usually so short because I usually upgrade to every new kernel release. My record uptime is over 176 days. The department server (a dual pentium pro Linux box) has been up for over 218 days, and the web server for the Alfred College of Liberal arts and sciences has been up for over 128 days as well. I think that the last time that it was down was for a hardware upgrade. I took over the spk project about four years ago. I made some progress on it, but I am forced into a hiatus due to slot conflicts that forced me to remove my modem. I've turned the project over to the people at linuxtelephony.org. My other projects are listed below. 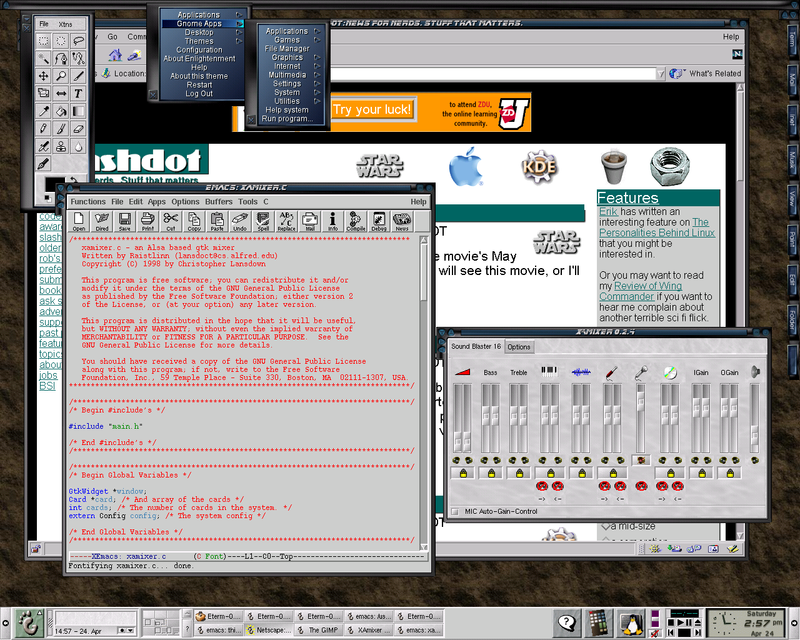 Working on the mixer has been very educational: I've learned much about gtk and Unix programming in general. GLfighter has also been both very fun and educational. I very much want to learn more about 3D programming. If you don't already run Linux, I urge you to check it out. It may very well be the greatest thing in the computer world since the transistor. As a note, my resumé is available upon request.